From left to right: Benji, Gunmin, J-Hoon, Heedo, Minpyo. B.I.G (Hangul: 비아이지; also known as Boys In Groove), is a six member South Korean boy group formed by GH Entertainment in Seoul, South Korea. They debuted on July 9, 2014, with their first digital single "Hello". 1.2 2014: Debut with "Hello" and "Are You Ready?" 1.3 2015: "Between Night n Music" and "Taola"
All five members of B.I.G were trainees before becoming members of the group and have an average of three years training between them. Three of the group's members: Gunmin, Minpyo and Heedo, trained at the well known Plug In Music Academy. Benji had previously been a student at Cleveland Institute of Music and Heifetz International Music Institute, and later attended Juilliard School, before dropping out in 2011 to pursue a music career in South Korea. He has been playing violin since he was four years of age and was a member of the Seattle Youth Symphony. Before joining GH Entertainment, Minpyo had been a Stardom Entertainment trainee and member of Topp Dogg's trainee group, Underdogg. Before debuting the members practiced together as a group for one and a half years. 2014: Debut with "Hello" and "Are You Ready?" On July 5, just days before B.I.G's debut, the group took to the streets of Myeongdong to perform. The official music video for B.I.G's debut single, "Hello", and accompanying single album were released on July 9. 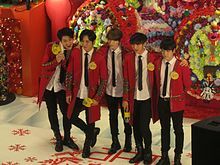 The song immediately gained popularity because of its high praising lyrics in regards to South Korea which highlight the culture and promote the country. The group performed their debut stage on SBS MTV's The Show on the day of their debut. On October 16, B.I.G confirmed their upcoming second single, "Are You Ready? "'s release date. The official music video and accompanying single album were released on October 21. The group began promotions from October 22, with their comeback stage on MBC Music's Show Champion. On December 12, B.I.G released their rendition of Wham! 's "Last Christmas" to thank their fans and celebrate their first Christmas as a group. 2015: "Between Night n Music" and "Taola"
B.I.G announced their third single, "Between Night n Music", on March 3, accompanied by a selection of individual and group teasers images. The new single album and accompanying music video were released on March 6. GH Entertainment confirmed in late January that B.I.G were preparing for their upcoming Japanese debut, with management from HY Entertainment. The group began promoting in Japan by holding showcases in Tokyo before and after their debut to help them become known. They officially debuted on March 23, with the Japanese version of "Taola", which peaked at number 15 on the Oricon weekly singles chart. On May 10, B.I.G announced that their first mini-album, Aphrodite, would be released later that month. The mini-album and accompanying music video for title track of the same name, were released on May 17. Promotions for the album began on release day with a showcase on SBS MTV's The Show. B.I.G held their first Japanese concerts labeled, B.I.G Japan First Live, on June 17 and 18 at Harajuku's Astro Hall in Tokyo. On February 3, 2017, B.I.G announced their return with the fifth single album, "1.2.3". The group would promote the single without rapper Minpyo, who was taking a break due to health problems. The music video was released on February 13. On May 15, B.I.G announced their sixth single album, Hello Hello, would be released of May 23. B.I.G held their first concert in South Korea entitled B.I.G Asia Tour in Seoul, on June 24, at the KBS Arena in Seoul. On July 5, B.I.G introduced a campaign song entitled "Remember", they released the digital single on July 7. In September B.I.G embarked or their first tour of Asia named The B.I.Ginning in which they played venues in Manila and Yokohama. Later that month they conducted their first overseas tour, the B.I.G Special Latin Tour, in Brazil, Chile and Mexico. On November 15, 2018, the group's leader J-Hoon enlisted quietly in the military without informing fans. It was revealed on January 19th, 2019 that a new member was added, Jinseok became the new maknae and is presumably taking the place of leader J-Hoon while he undergoes his mandatory enlistment. 2017 MBC Music B.I.G Project 4 Episodes. 2015 "Between Night n Music"
^ "비아이지 프로필" (in Korean). Naver. ^ "'인가가요' 신예 비아이지, '안녕하세요'로 차세대 아이돌 '눈도장'" (in Korean). Herald K. Archived from the original on 2017-04-25. Retrieved 2017-04-24. ^ "현재 공식적으로 아이돌 최다 배출 학원" (in Korean). Instiz. ^ "B.I.G's Benji Shows Off Julliard [sic]-Trained Violin Skills". Kpop Starz. ^ "Kids' Strings Sing At The Heifetz Institute". NPR. ^ "신인그룹 비아이지, 길거리 홍보+랩핑 버스+지하철 광고로 이색 마케팅 돌입" (in Korean). Ten Asia. ^ "신인그룹 비아이지(B.I.G), 데뷔곡 '안녕하세요' 공개" (in Korean). Ten Asia. ^ "신인그룹 비아이지 '안녕하세요' MV 뜨거운 반응" (in Korean). Ten Asia. ^ "비아이지, '준비됐나요' 5인 5색 멤버별 매력 포인트 파헤치기" (in Korean). Ten Asia. ^ "비아이지, '준비됐나요' 티저 영상 공개..상남자표 저돌적 사랑고백" (in Korean). Ten Asia. ^ "비아이지 '준비됐나요', 준비된 상남자돌의 당찬 세레나데" (in Korean). Ten Asia. ^ "비아이지, 캐롤 'Last Christmas' 음원 12일 정오 공개" (in Korean). Ten Asia. ^ "비아이지, 멤버별 티저 공개..다섯 남자의 몽환적 매력 발산" (in Korean). Ten Asia. ^ "비아이지(B.I.G), '밤과 음악 사이'로 컴백..몽환적 매력" (in Korean). Ten Asia. ^ "비아이지, 11월 보이그룹 컴백 대열 동참" (in Korean). Ten Asia. ^ "비아이지, 신곡 '타올라' MV 선공개..11월 가요대전 합류" (in Korean). Ten Asia. ^ "비아이지, 日 진출 신호탄 쐈다!..첫 단독 공연 '성료'" (in Korean). Ten Asia. ^ "비아이지, 23일 일본 데뷔 싱글 발매 "예약 쇄도"" (in Korean). Ten Asia. ^ "비아이지, 日 타워레코드 1위·오리콘 10위권 안착" (in Korean). News1. ^ "비아이지, 출격의 닻 올렸다!" (in Korean). Ten Asia. ^ "'컴백' 비아이지 "첫 미니음반, 욕심냈다"" (in Korean). Ten Asia. ^ "B.I.G Swept Japan With Its Concert". BNT News. ^ "비아이지, 신곡 티저 이미지 공개..'시선집중'" (in Korean). Ten Asia. ^ "비아이지, 13일 4인조 컴백… 국민표 잠정 휴식 (공식입장)" (in Korean). Ten Asia. ^ "비아이지, 홍대 게릴라 공연으로 '시선집중'" (in Korean). Ten Asia. ^ "비아이지, 5人 완전체로 돌아온다… 23일 컴백" (in Korean). Ten Asia. ^ "비아이지, 데뷔 이후 첫 단독 콘서트…"설렘 가득"" (in Korean). Ten Asia. ^ "'애국돌' 비아이지, 서울지방보훈청 홍보대사 위촉 "고귀한 정신 계승 위해 노력"" (in Korean). Ten Asia. ^ "비아이지, 마닐라 이어 일본까지 사로잡았다" (in Korean). Ten Asia. ^ "비아이지, 브라질 이어 멕시코 공연 '뜨거운 반응'" (in Korean). Ten Asia. ^ a b c d e f "B.I.G Members" (in Korean). GH Ent. "Aphrodite charting". Gaon Music Chart. "Hello Hello charting". Gaon Music Chart. ^ "2016년 05월 Album Chart". Gaon Music Chart. ^ "Oricon Chart" (in Japanese). Oricon Music Chart. ^ "비아이지(B.I.G), 특별한 매력 어필…'남다른 예능감 과시'" (in Korean). Top Star News. ^ "비아이지, 신곡 '타올라' 뮤비 선공개…'강렬한 남성미'로 시선끄네" (in Korean). Joongang Ilbo. ^ "비아이지, '아프로디테' 뮤비 티저 공개…칼군무+남성미 '눈길'" (in Korean). Asia Today. ^ "틴트·비아이지 '생명사랑 밤길걷기' 홍보대사로 위촉" (in Korean). Busan Ilbo. ^ "틴트-비아이지, '한국생명의전화 생명사랑운동' 홍보대사로 건강한 세상 만들기 기여" (in Korean). Ten Asia. ^ "비아이지, 대한민국문화연예대상 K-POP 신인상 수상" (in Korean). X Sports News. ^ "대만 인기 배우 왕동성, 아시아스타상 해외 부문 수상" (in Korean). Korean Economy. ^ "비아이지, 민주평화통일자문회의 평화통일 실천홍보대사 위촉" (in Korean). Ten Asia. ^ "비아이지, 2017 한국청소년연맹 홍보대사 위촉" (in Korean). Ten Asia. ^ "국내외 청소년 사회공헌사업 희망사과나무, 그룹 비아이지 홍보대사 위촉" (in Korean). News Wire. This page was last edited on 8 February 2019, at 20:14 (UTC).